The Gigabyte Aero 14 is neither the lightest nor the thinnest gaming laptop around, but it’s the most affordable machine in its class. Gigabyte is no stranger to thin gaming laptops, but the Taiwan-based electronics firm has outdone itself with the ultra-slim Aero 14. Measuring in at only 0.78-inches (1.99mm) thick and weighing 4.17 pounds (1.89kg), this 14-inch gaming laptop could almost be considered an ultra-portable. 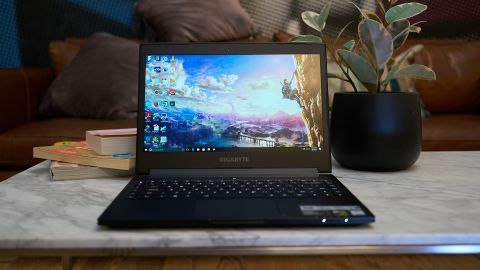 Gigabyte promises to deliver the affordable, ultra-thin gaming laptop of your dreams with a 3K screen, Intel’s latest quad-core Kaby Lake processors, Nvidia’s GTX 1060 graphics chip and a massive battery. However, that massive battery doesn’t amount to massive longevity, and its killer price is subsidized by plenty of bloatware. Still, the Aero 14 proves to be an incredible value. The Gigabyte Aero 14 comes well – and only – configured for $1,699 (£1,799, AU$1,999), and compared to its peers, you’ll be saving quite a bit. An equally-well-equipped Alienware 13 R3 and its spectacular OLED screen runs for a noticeably higher $2,099 (£1,949, AU$2,899). Meanwhile, the Razer Blade will cost you most at $2,299 (£2,249, AU$2,999) for the same level of hardware inside. Gigabyte laptops have always looked so minimalistic to a fault that the Aero 14 is straight up stylish. Rather than just a little flourish of orange, this 14-inch gaming laptop comes with a fully orange lid option – then there’s also a lime green version. But, for those that want to keep a lower profile, there’s still the traditional option of going with the black paint job and orange stripe. Colors aside, the top cover also features a small triangular area filled in with a tasteful crosshatched pattern – not unlike carbon fiber – for an extra flourish. The interior of the notebook is also quite a departure for Gigabyte, as the keyboard features a new and larger island style. This time, the keys are noticeably bigger with more spacing between each key. As you can see with the five macro keys included on the left-hand side, the keyboard quite literally stretches from one end of the machine to the other. Beyond the physical size of the keyboard, the key switches feel bouncy and offer firm resistance while typing. Just below that, you'll find a generously sized and silky smooth trackpad. Unfortunately, the Elan software driving this pointing device left us with fewer multi-touch gestures than we’ve become accustomed to with a Microsoft Precision Touchpad. The Aero 14’s biggest claim to fame is that – for all of the hardware inside – it’s actually pretty light. Weighing only 4.17 pounds (1.89kg), it’s certainly less back-straining than the 5.8 pound Alienware 13 R3. However, the 4.16-pound (1.88kg) Razer Blade and 3.96-pound MSI GS63VR Stealth Pro outpace the Aero 14 as lightweight champs. Measuring only 0.78 inches thick, the Aero 14 is also an awfully thin machine in its class. Unfortunately, this is also another area where the Razer Blade and MSI GS63VR top it with even shorter chassis measuring 0.70- and 0.69-inches, respectively. One area where the Aero 14 has no equals is how far the screen bends back. Forget about the humdrum 180-degree hinge, the 14-inch display can tilt back as far as 190-degrees, thanks to the laptop extended rear base. It’s a luxury we don’t see on 90% of notebooks, and we appreciate having the freedom to angle the screen really far back when we’re laying back on a couch or in bed. Aside from offering all the articulation we would want, the Aero 14’s screen is top notch. The display panel is so brilliant that 50% screen brightness is enough to overpower sunlight streaming into our office. Colors pop off the screen, which of course help to make media and games look that much better. Likewise, rich blacks dissolve into the bezels, though, darker contrast levels fall off quickly and end up blending together more than we’ve seen on the Razer Blade’s IGZO display or the Alienware 13’s OLED monitor. Considering that the Aero 14 is only equipped with an IPS display, we’re impressed it keeps up with its two closest rivals at all. Unfortunately, the 14-inch notebook’s speakers don’t leave as nearly as big an impression. They’re serviceable enough for playing music and game audio when you don’t feel like putting on a headset. Otherwise, bring along your gaming headset.